I had a little spare time on Saturday so decided to cook up a couple of things for the freezer. I think something may have gone wrong with my posting though because, according to the Dinner Diary archives, we haven’t eaten this since July 2009 which just can’t be right. I love spaghetti bolognaise and although I know I don’t cook it as often as I used to (it was a weekly staple for a long time, particularly during my student days), I can’t believe it’s been over a year since we last ate it. This is probably closest to the recipe I used today although (as I mentioned in that post) it does change depending on what I have in the kitchen at the time. I also cook the ragu for more like four hours nowadays, to achieve the silky texture that comes from adding milk. I added a generous dollop of Marmite this time too, to provide some extra depth which didn’t seem to be developing. I made a double batch this time so I can safely say that it won’t be a year until next time we eat it. In fact, I have some leftovers for lunch tomorrow which Stephen rather generously offered to me instead of somehow managing to keep them for himself like he usually does. 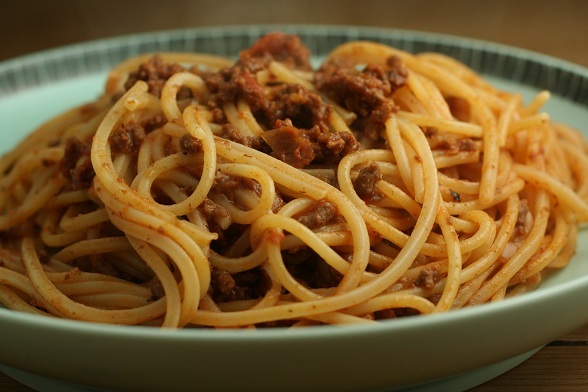 Subscribe to comments with RSS	or TrackBack to 'Spaghetti Bolognaise'. Interesting idea with adding milk; will definitely try that. So true – don’t tend to cook it nearly enough in proportion to what a fave it is. Best advice I ever had years ago was making it with half pork and half beef mince. You can definitely be adventurous – marmite is a great idea! I sometimes add a dash of anchovy essence and usually a splash or three of mushroom ketchup. It’s, as you say, perfect for making plenty and freezing. I’ve not tried with pork mince, I tend to use bacon, but will give that a go. Thanks for the tip.